Empire of Sleep is an interactive virtual environment installation viewed in stereoscopic 3D on a large rear projection screen. 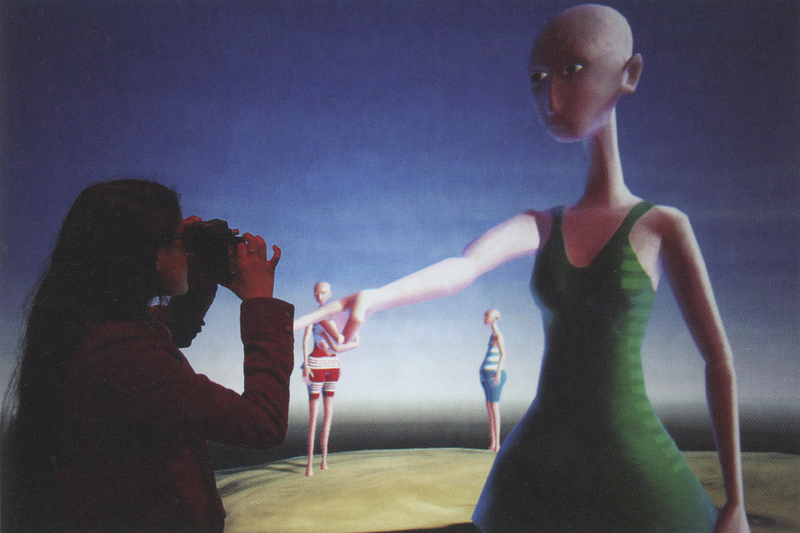 Participants interact using a hand-held camera to take photographs of the scene, triggering the virtual camera to move to new points of interest. A group of surreallooking figures, clothed in early 20th century bathing suits, are scattered about on several isolated sand bars somewhere on an open and calm body of water. They first appear as if there for recreation, but there is a pensive mood, as if some unusual event is taking place unknown to the viewer. Alan Price’s interest is in creating new forms of interactive and virtual cinema, in which the viewer’s experience is informed by alternate methods of both display and user input, creating an intuitive and visceral sensation for the viewer in extending his or her reach into the space in which the story or event unfolds, creating virtual worlds that have awareness and responsiveness to the presence of the observer. It is not about user intervention or control of the story, but rather the symbiotic relationship between the observer and the narrative event. Price is interested in designing physical user interfaces that are thematically interpretive of the subject matter represented in the work and, more importantly, that allow the viewer to feel as if physically extended into the virtual space, giving a sense of embodiment and immersion that dissolves the separation between the two. This is not limited to methods for engaging multiple senses or surrounding the viewer to make him or her feel physically immersed, but investigating ways in which actions and their familiarity, such as taking a photograph, provide a sense of playing a role and of being integral to the representation of events taking place.